Our commitment - to provide clarity for all. Our intention - This entire gate installation process will go as smoothly as possible for all of us. The Goal - to have this decision accomplished - within 7 days of us receiving the deposit. WHAT IS A LOCK BOX? - the steel housing around the locks, that we weld into our frames. If you would like the locks to be inset (seen here), then you must choose a lock with the circular housing. 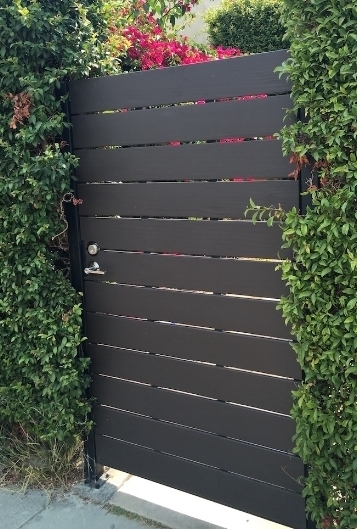 A great option for any exterior lock. This style will Last Longer than the electronic keypad locks. This style of lock requires a different style of wood installation. - Please see the images below these locks. In these photos, we cut a square around the locks, then trim around it. It still looks great! This is the only way to use these decorative lock options. THIS LOCK WE DO INSTALL - Mostly on Driveway Gates - We weld this into the frame.